Don't begin a sentence with and or but. Don't end a sentence with a preposition. Many more rule-breakers appear in this guidebook. For the sake of freshness, Williams seems comfortable with employing the comma splice, as in "Women have always been underpaid, they are now doing something about it," and omitting the comma between two grammatical sentences with a conjunction, as in "Oscar Wilde brazenly violated one of the fundamental laws of British society and we all know what happened to him." While you may not agree with all he has to say about clarity and grace, you will surely concede that he sensibly navigates through the politics of prose. BOOK BRIEF: "Writers at Work: The Paris Review Interviews"
Volume 1 (2006): Dorothy Parker (1956). Truman Capote (1957), Ernest Hemingway (1958), T. S. Eliot (1959), Saul Bellow (1966), Jorge Luis Borges (1967), Kurt Vonnegut (1977), James M. Cain (1978), Rebecca West (1981), Elizabeth Bishop (1981), Robert Stone (1984), Robert Gottlieb (1994), Richard Price (1996), Billy Wilder (1996), Jack Gilbert (2005), and Joan Didion (2006). Volume 2 (2007): Graham Greene (1953), James Thurber (1955), William Faulkner (1956), Robert Lowell (1961), Isaac Bashevis Singer (1968), Eudora Welty (172), John Gardner (1979), Gabriel Garcia Marquez (1981), Philip larking (1982), James Baldwin (1984), William Gaddis (1987), Harold Bloom (1991), Tony Morrison (1993), Alice Munro (1994), Peter Carey (2006), and Stephen King (2006). Volume 3 (2008): Ralph Ellison (1955) George Simenon (1955), Isak Dinesen (1956), Evelyn Waugh (1963), William Carlos Williams (1964), Harold Pinter (1966), John Cheever (1976), Joyce Carol Oates (1978), Jean Rhys (1979), Raymond Carver (1983), Chinua Achebe (1984), Ted Hughes (1995), Jan Morris (1997), Martin Amis (1998), Salman Rushdie (2005), and Norman Mailer (2007). Volume 4 (2009): William Styron (1954), Marianne Moore (1960), Ezra Pound (1962), Jack Kerouac (1968), E. B. White (1969), P. G. Wodehouse (1975), John Ashbery (1983), Philip Roth (1984), Maya Angelou (1990), Stephen Sondheim (1997), V. S. Naipaul (1998), Paul Auster (2003), Haruki Murakami (2004), Orhan Pamuk (2005), David Grossman (2007), and Marilynne Robinson (2008). 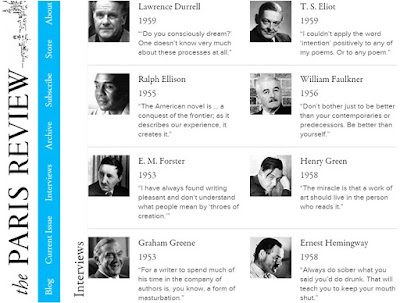 You can sample these interviews and many more--a total of 427 since 1953 as of this post--at the legendary Paris Review website. You cannot go wrong by reading a Steven Pinker book on language because you're bound to learn something. 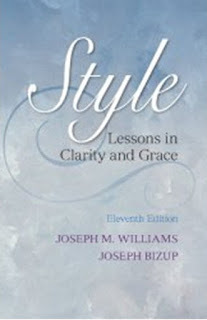 The Sense of Style has plenty to offer to those who have always felt that many English grammar rules border on the ridiculous as well as to those grammar snobs who wish to restrain prose writers in a linguistic straitjacket devoid of all imagination and elegance. 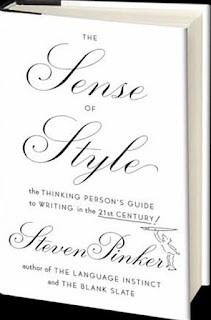 Early in this book, which serves as both an argument for clear reasoning about language issues and a writing style guide, Pinker makes the revelatory statement that all successful writers he knows do not use a style guide such as The Elements of Style, The Business Writer's Handbook, or The Gregg Reference Manual. In fact, they learn to write by reading relentlessly, co-opting the style of admired authors until they cultivate their own. As he does in The Language Instinct, Pinker cogently explains that grammar rules are arbitrary, therefore inviting the professional writer to take liberties with them in the name of original, fluent style. He takes on many of the myths about "correct" grammar, comparing popular belief with expert opinion and concluding with his own practical solutions. This book is worth a patient read. Instability is the one constant I have seen in my broad travels through the world of work in the private and public sectors over the past four decades. In my communication with hundreds of business owners and corporate executives, few, if any, have talked about a long-term vision for their company. They're too busy reacting to the latest must-have technological advancement, the most recent business security threat, or the most pressing client opportunity to concern themselves with a 10-year or even a 1-year plan. While acknowledging the realities that shape such a mindset, Jacob Morgan wants to change it. 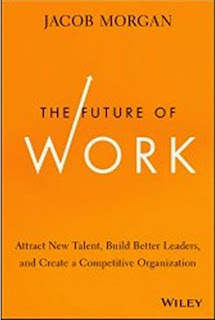 In his latest book, The Future of Work: Attract New Talent, Build Better Leaders, and Create a Competitive Organization, Morgan reveals the sensibilities of today's office and workers that undermine managerial nearsightedness and demand a fresh approach to hiring, cultivating, rewarding, and keeping excellent staff. In doing so, he also renders a practical reference guide for how employees should see themselves if they are to benefit from breaking developments in the workplace. Morgan begins with a look at technological and demographic trends that continually spark new workplace behaviors. It's already old news that we are living a more public life through social networking, blurring the distinction between our personal and professional lives. We have parlayed our acceptance of instability and disruption by seeking greater flexibility in our work hours, locations, and assignments, and by expecting management to broaden its employee evaluation criteria and recreate its corporate ladder. Our acclimation to an endless barrage of data has inspired us to customize work, adapt our devices, and share information and responsibilities. Disappearing are annual performance reviews and managers making business-critical decisions in a vacuum of hoarded information and predetermined work structures. The new business leader, says Morgan, must "follow from the front" and embrace the vulnerability that comes with organizational flattening and vanishing hierarchies. He cites case studies from Cisco, General Electric, Microsoft, Unilever, Whirlpool, and even the United States government to tout a managerless company that fosters employee retention, quicker decisions, and happier customers. Closing with 14 principles of future organizations, and the required steps to overcome roadblocks that stand in their way, Morgan offers a compendium of a whole new world of commerce and its consequences. Armed with this knowledge, entrenched and aspiring business leaders might well get a better handle on their company's future. 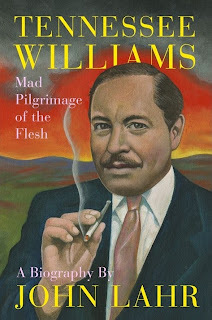 Any skepticism that I have long harbored about paralleling an artist's private and creative lives has been dashed by John Lahr's brilliant biography, Tennessee Williams: Mad Pilgrimage of the Flesh. I have read all of Williams's published drama, poetry, fiction, and nonfiction, including his memoirs, letters, and interviews. While much of his work falls short of greatness and some does not even rise to mediocrity or is downright poor, I have greatly valued every minute of that reading time. Williams was a remarkable artist who might have been hurt by negative criticism from the literary establishment, but he never succumbed to it. The inevitable pressures imposed by theater, film, and publishing circles, and by the celebrity he simultaneously craved and detested, did not stop him from creating until his accidental death in 1983. A review of his 55-year career as a man of letters shows one constant: He always wrote, always took chances, always brought new experience into his work. He had many works in progress despite struggling to find productions in lesser known venues and before smaller audiences. Through exhaustive research from virtually every source that touched Williams's world from his childhood until his final days, Lahr captures an epic yet realistic portrait of a man, one which so many earlier biographers and critics failed to achieve, due largely to their fetishistic focus on the more bizarre aspects of Williams's lifestyle and his legendary creative failures. Those accounts are hard to swallow because even Williams's apparent dramatic missteps, such as The Milk Train Doesn't Stop Here Anymore and In the Bar of a Tokyo Hotel, are far better than the notices they received. Until Lahr's book, I had been continually disappointed by how Williams scholars caricatured him by eschewing the motivation of his work and the inclinations of his genius in favor of spotlighting his melodramatic lifestyle, admittedly brought on by Williams himself, as can be seen in his autobiographical accounts. Lahr, however, understands that the most fantastic fiction is often autobiography, so he does not take the obvious short cut of regurgitating what Williams said or wrote to make a point about his lasciviousness, despondency, or self-destructiveness without first positioning those viewpoints in their historical context. He moves seamlessly among an astounding range of letters and interviews by Williams’s friends, family, and lovers; his texts, journals, and interviews; and reviews, articles, and other public records to create a fascinating story of one of the most well-deserving highly awarded writers in American history, one whose theatrical revivals command huge audiences the world over more than three decades after his death. This book is a masterpiece of biography.